It's been a while since I've shown you any pictures from the house, and since it's either that or a picture of the bowl of un-cast-on yarn that torments me from its position beside my phone, let's look at the custom cabinetry! There is a lot of it. What you're looking at here is a view of the living room from the place where our kitchen table will stand. There will be a TV in the centre below a set of shelves that stand behind glass doors, but all around it we will be storing books. The really special books, like my original Judy Bolton collection, will go behind glass so they don't get dusty, and I'll try to make them look pretty too. I was of two minds when we bought our table… or rather when it arrived after being made for us. I had always wanted a white painted table, but when it came I realized it really is white, and everything else in our kitchen is off-white. I may paint it again, but I'm putting a tablecloth on it anyway and the legs are heavily turned so it may be okay in the end. The other surprise was the tabletop itself which is quite thin and has crisp edges all the way around in a way that looks more modern than I expected. I have come to love that though, now that it's got a tablecloth over it. It just ends up looking very clean! 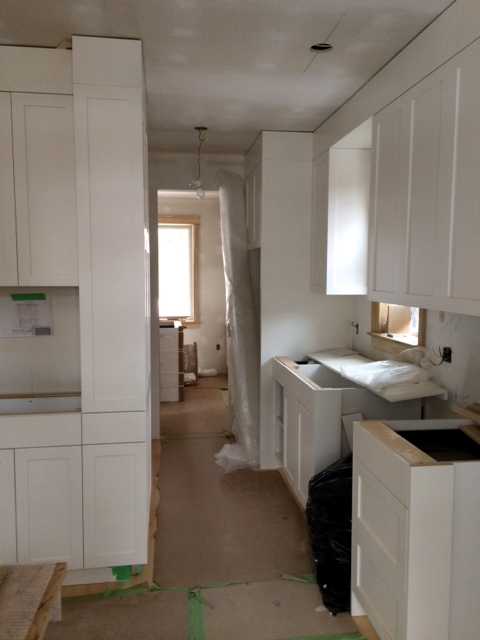 This particular bank of cabinets is for breakfast cereal and tea and toast… The small sink is at the far end and will be deep enough to fill a kettle without being in the way of anyone who is washing dishes or getting things out of the refrigerator around the corner. If we're having a party, it will probably serve as a drinks station, with a tray of glasses and different beverages easily accessible. This part is what I imagine a galley kitchen in a small apartment in Manhattan would look like. It's probably too tight for some, and I'm not sure whether we will find it difficult to have the refrigerator in such a narrow space over time (it is tucking in at the end of the counter on the right, past the window.) But there was no other place to put it so we're living with it! The advantage of this layout is that the messy part of the kitchen – the sink, the refrigerator – is hidden from view if you are in the living room. The dining room is beyond through the doorway, but I am planning to hang a beautiful drape there so that if we are having a dinner party we can draw it shut and hide our food prep shame. If you can believe it, that window was once over our tub – that's where our bathroom used to be. It was the only window we could keep on that wall so we are using it to bring natural light to our sink. Standing where the range will go, you can see the shallow counter that faces the refrigerator and main sink, as well as the pantry area that frames it. The pantry is only about 15 inches deep, which is perfect because we won't lose things in the back now, and it's very tall, reaching almost to the ceiling along with all the other upper cabinets. My plan for those top, almost unreachable shelves, is to store seasonal decorations right there in the kitchen where I can get at them quickly as special holidays come up. Or maybe they will fill up with boxes of knitting, ahem. Getting back to that shallow counter though – this is, to me, the second most special place in the kitchen! I am so excited to have a dedicated place to manage all the mail that comes into the house, all the paperwork we ever have to do. 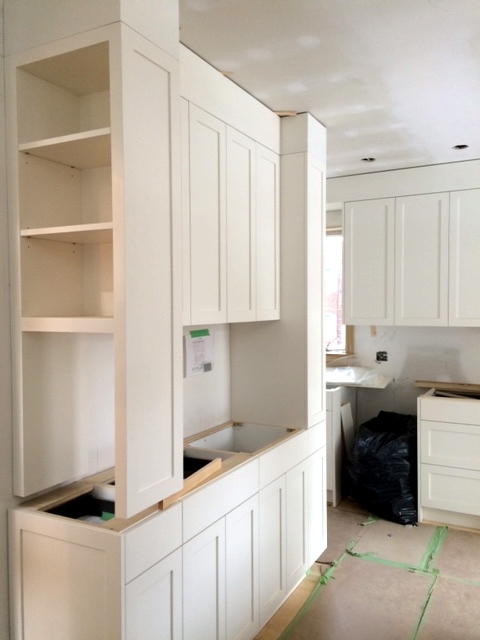 It is incredibly quiet in this space because of all the cabinetry around it. I plan to use it as a standing desk area, so that I'm not just sitting all the time when I work. And again, if we are having a party, it's a perfect table for setting out trays of nibbles or a jug of cider surrounded by some glasses. I don't have a picture of the most special place, which is the baking counter. It will be on the other side of the kitchen table facing the tea and cereal counter and because there is no upper cabinet there, I can leave my mixer out all the time exactly where I need it. Yay! 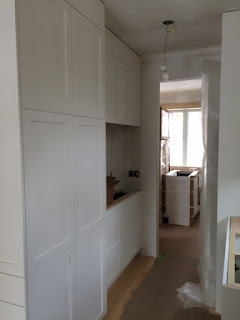 It's just about a year since we started planning our kitchen, and obviously we have put a lot of thought into it, but in a year you can change your mind about a lot of things. If I were doing it today I would think seriously about the kind of cabinet door that is inset in the frame with a visible hinge. My understanding is that they're not as popular in North America as they are in the UK, and definitely they are a lot more expensive which really counts when you are talking about this much custom millwork, but I love the way they look like built-in furniture. I still feel our colour choice was right for our house because in spite of many additional or larger windows than what we had originally it could be quite dark inside if we hadn't chosen so many light finishes. I have to admit though, the other day I saw the most gorgeous kitchen on a UK househunting show where all the cabinets were painted an amazing sky blue. The advantage of white cabinets is that they don't date and it's true that sky blue could get tiring and look dated fairly quickly. But the way that kitchen was done it just looked vintage and to me, vintage never goes out of style. It made mr feel so happy! I would be really tempted to do a blue kitchen if I were buying ours now. Even though obviously our kitchen is visible from other rooms and having a colour there would really limit what we could do elsewhere. Probably it's a good thing we chose this last spring, huh? When you are working with a contractor like ours, who is really an artist and insists on a high level of quality control for every finish, you are going to be looking at a long renovation. Also you are vulnerable to setbacks like health issues or traffic accidents and we've had our share of those! Thankfully everyone involved with our project is fine right now and will hopefully stay that way, and the end is definitely in sight. Underneath the heavy paper in these pictures is a beautiful hardwood floor in clear stained maple sourced locally and installed by a very good (and super nice) tradesman. The temporary stairway you can almost see from the living room door is about to be replaced with the final set, again in clear stained maple with white risers. 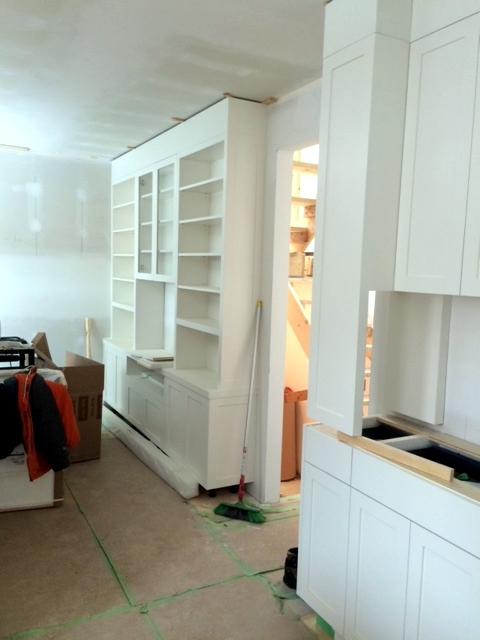 We asked for a lot of fancy trim – crown moulding, complex window and door framing, and rich-looking baseboard – and that takes time to cut and install but it's nearly done now too. And it all looks so beautiful. It's still a small house really, but every bit has been so thoughtfully finished, we feel incredibly fortunate to have it to move back to. The knitting pictures I will be able to take in this house… honestly I can't wait! Hope you have a wonderful weekend and I'll see you back here again very soon. House is beginning to shape up. When is the big move in day, approximately? Show us the ball of unknitted yarn pease.